Australia, 2015, 96 minutes, Colour. Mandahla Rose, Julia Billington, Brett Rogers, Simon Bolton, Lex Marinos. 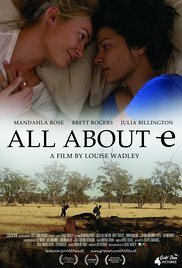 All About E is a small budget film, the title with an echo of the Betty Davis film, All About Eve , a story about a young woman from Sydney who gives up her studies of the clarinet in order to be a DJ at a club. The club is run by a shady character, money changing, drugs, and demanding creditors. The central character, E, has been involved in a love relationship with a woman from the country, Trish, but has other liaisons. The intention of the filmmakers is that this be a film with a lesbian agenda, out there for the public to respond to. The main action of the film concerns E and her gay roommate, Matt, fleeing the club owner with the money that was misplaced in a taxi. Refused help by her parents and a friend, she and Matt decide to go to Trish’s farm in the country where they are temporally safe but the owner tracks them down, a confrontation – and helicopter rescue. Mandahla Rose as E is a strong screen presence. 1. An Australian story? Universal story? Relationships? Sexuality? 2. A film about lesbian characters, in themselves, the relationship, their love, the consequences? 3. The Sydney settings, the club and the disco, types and customers, drugs? The flats? The streets? Countryside, the farm, the paddocks, the sheds? Authentic feel? 4. The musical score, the disco, the songs? 5. The title, application of All About Eve? 6. The introduction, E and her sexuality, the relationship, everybody waiting for her to come on stage, her arrival, her talent as a DJ? 7. The staff at the club, Johnny, his relationship with E, wanting to dominate her? His henchmen? The issue of the money, the suitcase, its disappearance? His searching, the CCTV, suspicions of E and Matt, the pursuit? 8. Matt, gay, at the club, sharing the flat with E, online searching for a partner, the money, his fears, wanting to give it back? E and her determination to keep it? Hundred dollars donation to the kids and the appeal? The men pursuing them? 9. Going to her parents, their hopes for her, playing the clarinet, giving up her studies, her believing in her talent as a DJ? Her mother’s reaction, her father’s? Going to her friends, the refusal to take them in? 10. The decision to go to the country, the flashbacks to her relationship with Trish? 11. Go to the country, Trish receiving them, their staying, Johnny turning up, their running away, with the money? The helicopter? The confrontation, Johnny with the gun knife, threatening Trish, Matt and his fear, The gun, the threats, the escape with a helicopter? 12. And the helicopter dispersing all the money…?